Modern genre fiction, that is science fiction and fantasy from the post Cold War era, is certainly entertaining, but not challenging — a meal replacement pill as compared to Haute cuisine. The authoritarian communist threat is done, and the public generally views space exploration as passé. As scifi authors, Huxley and Orwell were born at just the right time to write about “big” ideas. I said as much to Jason Snell in a Twitter conversation who answered my question, “What value genre fiction?” with the question, “What value fiction at all?” Jason recommended of Paolo Bacigalupi. His first novel The Windup Girl had a difficult task: besides telling an engaging story, Bacigalupi had to restore my faith in genre fiction. He did splendidly. 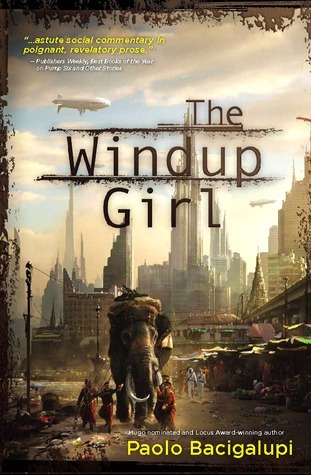 Sign into Goodreads to see if any of your friends have read The Windup Girl.